The number of hate crimes reported in the United States jumped by 17% last year, the largest increase since 2001 when the terrorist hijackings on 9/11 fueled a surge in attacks on Americans of Muslim and Arab ancestry. A total of 7,175 hate crime incidents were reported to the Uniform Crime Reporting (UCR) Program in 2017, up from 6,121 in 2016, said the UCR Program’s annual Hate Crime Statistics report, Xinhua reported. It’s the third year in a row the FBI has reported an increase in hate crimes. The number of hate crimes in 2016 rose about five percent from 2015. The 2017 incidents encompass 8,437 total offences, meaning some involved multiple criminal charges. According to the report, the most common bias categories in single-bias incidents were race/ethnicity/ancestry (59.6 percent), religion (20.6 percent), and sexual orientation (15.8 percent). The victims represented a cross section of society, with African-Americans and Jews the most frequently targeted victims. Of 34 bias motivation categories tracked by the FBI, all but five reported an increase. Of crimes motivated by race, ancestry or ethnicity, about 48.8 percent were motivated by hatred against African Americans, 17.5 per cent stemmed from bias against whites, and 10.9 percent were classified as anti-Latino or anti-Hispanic bias. In addition to the 7,106 single-bias incidents reported last year, there were also 69 multiple-bias hate crimes reported. About 5,000 of the hate crimes reported were categorized as crimes against persons, such as intimidation or assault. About 3,000 were considered crimes against property, such as vandalism, robbery, or burglary. Some hate crime incidents are classified as both crimes against persons and crimes against property, the report noted. The report, Hate Crime Statistics 2017, includes hate crime information for last year, broken down by location, offenders, bias types, and victims. The number of law enforcement agencies reporting hate crimes also increased with about 1,000 additional agencies contributing data across the country, the FBI noted. 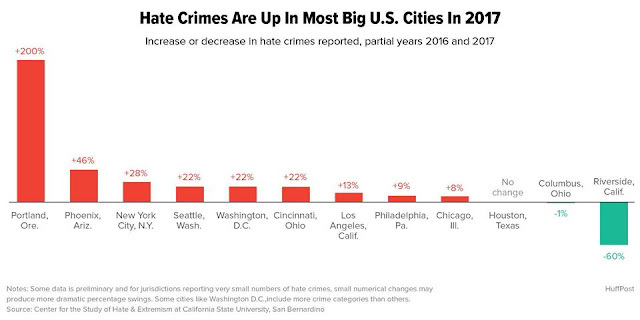 Reporting hate crime data to the UCR Program allows the public, researchers, community leaders, and local government to raise awareness of the issue and gain a more accurate picture of hate crimes, said the FBI on its website.